A Monthly Magazine Devoted to Cabbalistic Science. Boston, MA. Publisher: Cabbalistic Publishing Company. Editor: Naphtali Herz Imber. 1/1, August-September 1895, 2 issues only. 70 pp., $3.00/20s. a year. 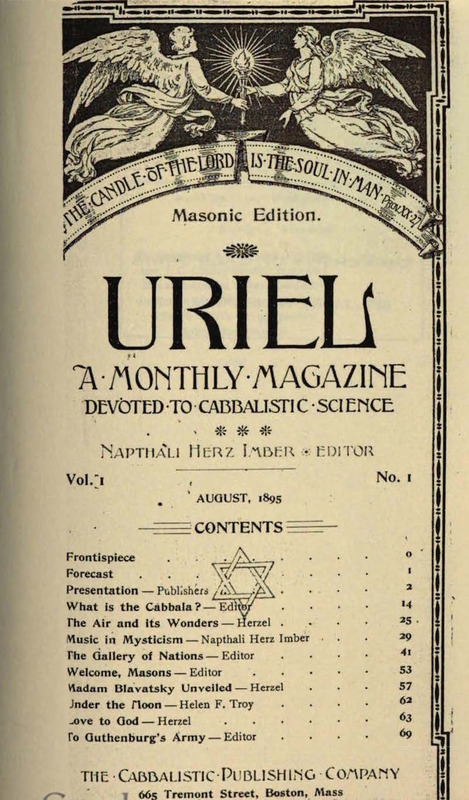 This was the first journal in America devoted to Kabbalah. It was based on the premise that "the sealed Book of Life will be opened by the Key of the Cabbala." Imber (1856-1909), as Boaz Huss has discovered, was not only the author of "Hatikvah" and an accomplished Kabbalist, but also an occultist and sometime Theosophist: Moses for Imber was, appropriately, the "Mahatma Moses." Imber was decidedly eccentric. He was born in Galicia and then in his teens wandered to Constantinople, where he met Laurence Oliphant and his wife, whom he followed to Palestine. He contributed, he said, the outline for Oliphant's Sympneumata and certainly contributed to the work. He immigrated to the United States in 1890 and by 1893 was trying to establish a society in Boston, funded by a rabbi and a Theosophist, to translate the Zohar. Imber was never in the good graces of American "reform" Judaism, which he felt had abandoned or never learned the real basis of Judaism in the Kabbalah, and he advocated a view of the Kabbalah that placed its origins in the Chaldeans, from whom Abraham learned the wisdom he embodied in the Sepher Yetzira. Jewish Theological Seminary of America; University of California, Berkeley.